Lachung situated at an altitude of 8610 ft in North Sikkim is located in 128 kms from Gangtok is the most remote destination in India. Areas around Lachung are renowned for its exceptional Himalayan views. 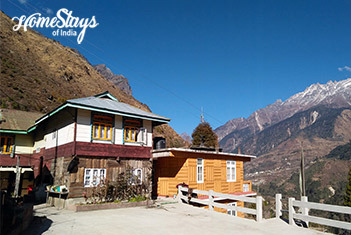 Sprawled across the banks of the Lachung River which slices the village in two, Lachung is famous for its apples, peaches and apricots. Despite throwing its doors open to tourists, Lachung still retains its distinctive culture and tradition, including the unique system of self-governance called Zumsa where all local disputes are settled by a representative body of the village which is headed by an elected Pipon. At Lachung you can visit the Lachung Gompa, built around 1880. Another attraction is the handicraft center which has exquisitely woven rugs and blankets. You can also visit the Shingba Rhododendron sanctuary through which flows the Yumthang River. The sanctuary is known for its abundance of Rhododendron trees and shrubs. Lachung is perfect for an overnight halt before you visit the spectacular Yumthang valley. 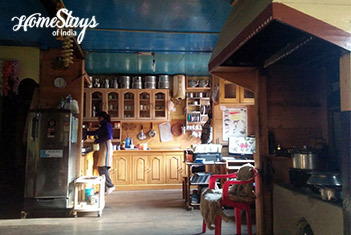 If you are looking for a real rustic homestay with a village feel in Sikkim, stay at the Lachung Homestay, ensconced right inside the village and is at the foot of the hill that grows high up at the back. It is surrounded by Apple, Poplar, Rhododendron and Arboretum trees. Potatoes, Cabbages, Spinach and other vegetables also grow around. 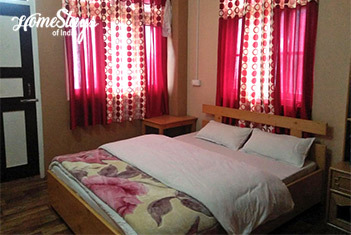 There are only two rooms, with a double bed and a single (for a couple with kid) in each room, available for visitors with running hot and cold water. 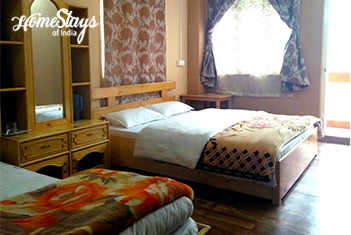 Rooms are spacious and clean with private verandah and attached English toilet. A Bhutia, Hishey Lachungpa is an artist by heart and Animator by profession. He loves travelling and trekking, meeting people, sharing local folk stories, love cooking and farming. Hishey offers Homemade Sikkimese organic food. Breakfast as per guest choice like, Alu Paratha, Potato Roll the sikkimese way, Sandwich, Butter Toast, Bread Omelet, Puri Aludum, Pancake etc. Dig your own potatoes or pick spinach to make your own dinner or visit the neighbors for a chat over endless cups of tea. 1. Lachung (8600 ft) is a small riverside village best visited in Summer. 2. Lachung offers snow peak views, cool weather even in peak summer. 3. Yumthang valley, a big plateau surrounded by beautiful snowpeaks. 4. One can get snow in Lachung till March/April and in May one can see wild flowers and Rhododendrons. 5. 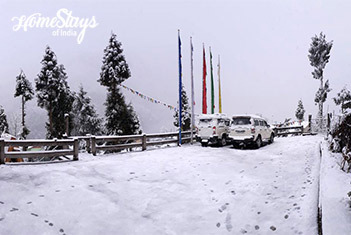 One can travel upto Yumesamdong from Lachung where one can get snow even in summer. 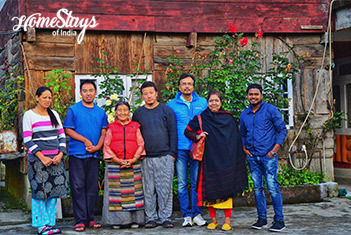 We had an amazing trip of North Sikkim with your team “Homestays of India”. 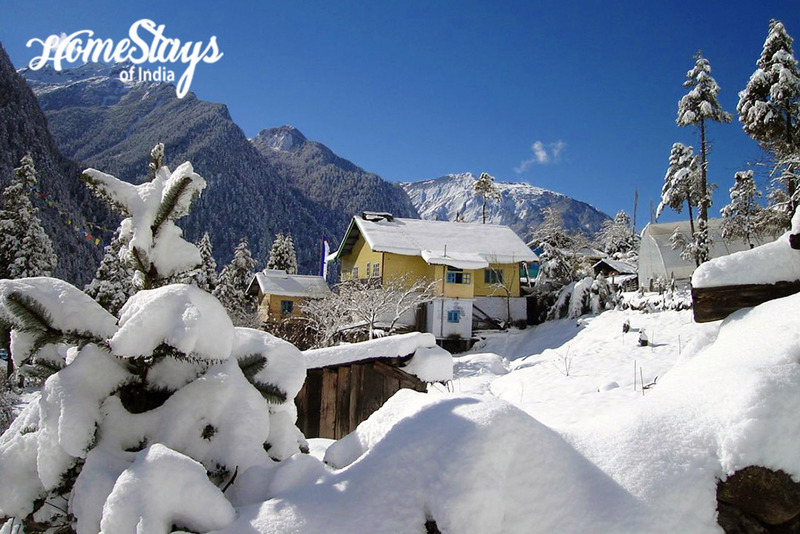 Our Homestay at Lachung stole our heart. Its the most amazing place to stay in Lachung i m sure. The rooms had lovely View of Snowy peaks and Teesta together from the balcony. Also fresh and hot homemade food was the best that we could get at such heights which gave us strength to sustain and survive the rough terrains of the location. Amazing Homestay. We truly felt at Home.